What is the Exchange 2007 Global Address List? What Happened to RUS in Exchange 2007? An inventory of all Exchange 2007 objects. The situation, you want to modify the GAL, however, you discover that you cannot edit (or delete) the Default Global Address List. This is the master list of all the Exchange 2007 objects, and the operating system won’t let you mess with it. Fortunately, there is a well respected work-around, create a new Global Address List, and then ‘update’ the mailbox. This procedure has its own PowerShell command. As an alternative to clicking in the Exchange Management CONSOLE, you could type commands in the Exchange Management SHELL. Using cmdlets like those below will save you time, more so when you realize that every Exchange 2007 configuration task has a faster command-line equivalent. Furthermore, certain commands are ONLY available in the Shell, for example, new-GlobalAddressList. Help with error message: ‘Access to address list service on all Exchange 2007 servers has been denied’ try the following. Begin with a clear idea of what you want to achieve with a custom address list. Presumably, making it easier for Outlook users to find addresses ranks high on your agenda. If you are doing this task for real, as opposed to just learning about Exchange 2007 Address Lists, then involve at a cross-section of users before you design a complex, multi-levelled, address list scheme only to find that the end-users hate it. Quite frankly, RUS was slow and cumbersome, so he won’t be missed now that his role has been incorporated into Exchange 2007. Exchange 2003’s RUS (Recipient Update Service) has been replaced in Exchange 2007 by two PowerShell cmdlets, update-AddressList and update-EmailAddressPolicy. Thus, don’t go looking for RUS in Exchange 2007, instead launch the Exchange Management Shell and experiment with ‘Address’ family of cmdlets. 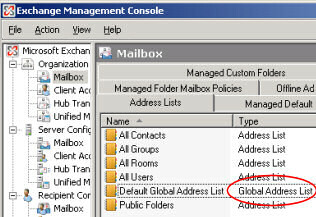 Exchange 2007’s E-mail address policy generates email addresses for your users, contacts, and groups. This is important, for without an address nobody could send or receive emails. 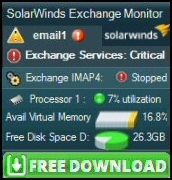 The killer reason to configure this setting is to adjust the way that email addresses display in the Exchange 2007 GAL. For example, small companies display email addresses as FirstName LastName, whereas large companies display prefer, Lastname, Firstname. 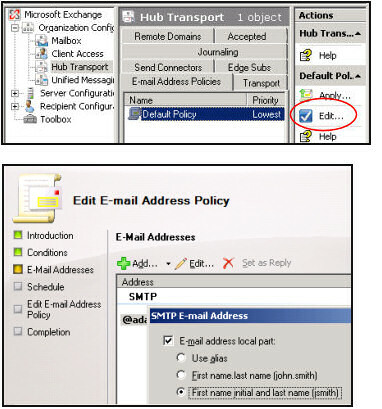 It is small companies who are exapanding that need to change their Email Address Policy, this is how you can adjust the Exchange 2007 GAL settings. Principles and techniques that you learned with other Exchange 2007 ‘Address’ names, will be useful for the Offline Address Book. Please take note, this is not the Global Address Book. Where Exchange 2007 and Exchange 2003 coexist, you can edit the GAL or the Address List objects from either Exchange 2003 or Exchange 2007. However, there are two ‘gotchas’; firstly, you must upgrade Exchange 2003 objects before they can be edited by Exchange 2007. Secondly, if you do upgrade the object, then you cannot edit it from Exchange 2003. I often say that being good at computing means being aware of subtle difference in Microsoft names. Exchange 2007’s mail objects is a case in point. Pay careful attention to the difference between a mailbox enabled user and a mail-enabled user; a security group and a distribution group. Here is a list of the objects which you find the Global Address List. If the GAL is slow to update, then look to the Global Catalog servers. Make sure that there is Windows 2007 Global Catalog server near the Exchange 2007 server. As you may know, the Global Catalog replicates a sub-set of all the user’s properties, including Exchange features such as email address. So if Exchange has access to a local Global Catalog server, then its GAL will be up-to-date. It’s only natural that Outlook users try and find each others email addresses in the GAL. But why would an administrator need to configure Exchange 2007’s GAL? The most likely answers are: control how the names are displayed in the Global Address List, and possible the need for custom lists.